Excellent argument, and powerful reasoning. I can relate to much of this. One challenge I find is that my wife and I often don’t exactly agree on what should stay, what should go, or even what constitutes clutter. Further, I’m more of a tidyer (any such word), and she’s more of a cleaner. I will organise before cleaning, and she will clean before organising. I wouldn’t have it any other way. I’m certain they don’t need. Ha! How timely since I JUST got finished decluttering a few cabinets in my kitchen. I have the kitchen table full of stuff I want to get rid of but I feel like I have to ask my husband first. Most of it’s his. I will have a battle on my hands when he gets home. For decluttering I use the one year rule. For bringing stuff in the house I use the “never have two” rule. I know one lady who has quite a bit of clutter in her house and I’ve noticed that it’s because she never uses ALL of anything. Like lotions for example, she has 150 little bottles of lotion all over the place that all have one or two uses in them. It’s like she can’t use it up because she likes it and doesn’t want it to be gone but she can’t throw away the bottle because there is still some left. And she does this with everything. That’s great Ashley. Sounds like you’ve got it figured out. Good point with the clutter lady you know. I can’t stand have near-finished stuff around. Drives me nuts. This issue quickly goes away when you get used to moving from apartment to apartment over the course of the past several years. When you move 2 or three times within 2 years, you realize pretty quick that the less stuff you have, the less stuff there is to move. Of course, when that far-off day arrives where I actually settle down and buy a house, I’ll have to remind myself to de-clutter from time to time. That’s exactly where I’m at, as I’ve actually moved 3 times within the last 2 years. Before my last move, I cleared out so much of my extra furniture and other crap I had lying around. It’s been a big help, but it still takes work to prevent a buildup from happening again. Hi Jeffrey. Enjoy reading your blog. I find clutter, especially in the kitchen, quite stressful. 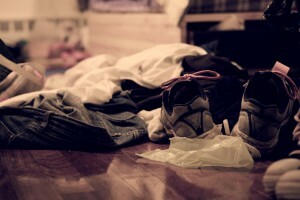 What’s your feeling/reaction to clutter? I totally live by the “one in and one out” method. I actually have a REALLY hard time buying new things unless I have something I know I don’t mind throwing out. “Only you can defeat piles of clutter”. Love it!